Tally MCA-2151. Dale Menten. I Really Wanted to Make a Movie. 1975 LP includes Drive-in Theaters, Too Much of a Lady, Montana You're My Lady, Houlerah, Bingo, What Can I Say. All tracks arranged and produced by Dale Menten. Menten on acoustic guitar. Sealed LP; cover with photos and graphics is VG with cut out at top right and retail sticker on shrink wrap. 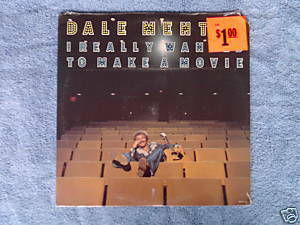 Dale Menten was a member of the 60s garage band and Soma recording artists The Gestures ("Run Run Run"). This album probably sounds little to nothing like them.